Are year-end movie lists the only thing still affected by the vagaries of old-fashioned international distribution? 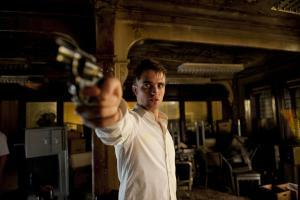 Elsewhere in the world, The Master and Cosmopolis appeared on 2012 lists. They ran later here. But then we seem to have got Only Lovers Left Alive earlier than everyone else. The other question is how much longer we will be talking about “films” in this way. Behind the Candelabra nearly made this list and it was famously – notoriously? – television first. 1 THE MASTER (dir. 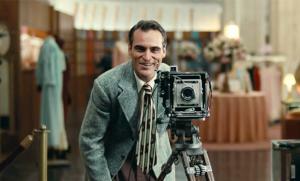 Paul Thomas Anderson). Paul Thomas Anderson’s two late 90s masterpieces – Boogie Nights and Magnolia – were ambitious but schematic. His two more recent masterpieces – There Will Be Blood and The Master – have a greater sense of human mystery, sadness, failure and ambivalence while remaining nearly epic in their scale. They are films you return to again and again, and you still come away slightly mystified. I don’t even pretend to understand exactly what “happens” to Freddie Quell (Joaquin Phoenix) and Dodd (Philip Seymour Hoffman) over the course of The Master and I’ve been back three times now – that sense of inexhaustibility must be at least part of what makes the last two Anderson films such great art. No one else is making movies like these. Next up from him: an adaptation of a novel by professional mystifier Thomas Pynchon. 2 GRAVITY (dir. Alfonso Cuaron). Will surely do for space travel what Psycho did for showers and Jaws for beaches. Also, is there a loose theory that a great science-fiction film appears every decade or so as an instant classic and popular favourite to push the entire form forward, like an evolutionary jump start? Nothing looks the same after, whether it’s Metropolis, Forbidden Planet, 2001: A Space Odyssey, Star Wars, the first two Terminators, The Matrix and now Gravity. But if those earlier examples are films of their moments, readable as culturally resonant as much as they were technical achievements, then what is Gravity saying about 2013? Or is it too early to tell? There could be something of this time in its dogged realism, its up-close intimacy and constant anxiety. This is not even science-fiction, really – this is the easily possible (nerd quibbles about physics aside). There is no mysticism about space any longer and nothing utopian about technology. Space is not a gateway to the future or to a greater beyond, except maybe to the lure of death. There is only the self in its immediate moment, reduced to the basics of survival. Yes, it could have been more minimal, of course. While it was admirable that we didn’t get Apollo 13-style scenes with Nasa technicians sweating it out on the ground like air traffic controllers talking Ryan (Sandra Bullock) down, we also didn’t need Ryan’s sad back story to care. Surviving is a big enough motivation for any of us. But still, Gravity also means seriousness and this was Alfonso Cuaron and his son Jonas’ form of it. In space, no one can see you cry 3D tears. 3 THE ACT OF KILLING (dir. Joshua Oppenheimer). Not just a very different atrocity documentary, this is also the year’s most original movie about movies, even a study of their worst effects. Joshua Oppenheimer discovered that it was impossible to make a film about the victims of the 1965 military coup in Indonesia but there were fewer difficulties making a documentary about the thugs and killers who thought – and still think – they were doing the right thing. They didn’t take much persuasion to star in stylised re-enactments of their crimes, based sometimes on their favourite movies (how often is Scarface the criminal’s film of choice?). The world is turned upside down and morality has gone AWOL. But for all Oppenheimer’s efforts in amplifying the surrealist dread of recent history, the most hideous moment might be the footage of killer Anwar Congo treated as a popular hero on an Indonesian chat show. The version to see is the director’s cut, which played at the International Film Festival. As horrible as it gets, more is still best. 4 ONLY LOVERS LEFT ALIVE (dir. Jim Jarmusch). Jim Jarmusch’s vampires were always going to be the coolest vampires. In Jarmusch’s best film since Dead Man – and that’s saying something – Tilda Swinton and Tom Hiddleston are the vampire lovers, living apart in Tangier and Detroit. Both locations were surely picked for their counter-cultural significance, and in its languid nocturnal scenes, Only Lovers Left Alive is a tribute to the beautiful decay of Detroit as much as it is about the pleasures of being marginal. As well as being thirsty and immortal. 5 BEYOND THE HILLS (dir. Cristian Mungiu). 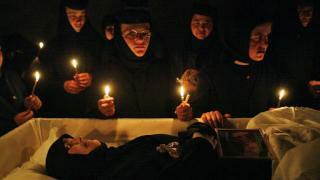 There is a new generation of Romanian cinema distinguished by patient narratives, clear observation and deep humanism. Exhibit A: Cristian Mungiu’s 2007 Palme d’Or winner 4 Months, 3 Weeks and 2 Days, set in Romania during the last days of communism. His third feature, Beyond the Hills, is set closer to now but the rural Moldavian setting is that much more remote and Romania stills looks broken and transitional. Working in Germany offers young Romanians the promise of money but the price is social and cultural isolation; life in a monastery offers safety and structure. Like 4 Months, 3 Weeks and 2 Days, Beyond the Hills has two young women at its centre, living within Romania’s imperfect systems and ineffectual authority. Voichita and Alina grew up together in an orphanage – one stayed and the other emigrated. Another link to the earlier film is that you could see the almost cult-like monastery, with its deviations from Orthodox practice, as a version of the communist satellite states that became defined by the monstrous egos of their paternalistic leaders. Mungiu’s source is a true story of an exorcism that went wrong but his screenplay is not dismissive of the world of faith or superstition – he recognises the consolations it offers. The ultimate lesson is that it turns out that there are exorcism films that avoid the schlock excesses of Hollywood. Not saying that schlock excess doesn’t have its place but wouldn’t you rather see more Requiems and fewer Exorcisms of Emily Rose? 6 THE PERVERT’S GUIDE TO IDEOLOGY (dir. Sophie Fiennes). There are intentional meanings and there are unintentional meanings. For example, James Cameron thought he was making a film in which a woman from first class and a guy from steerage overcome their class differences and fall in love before an iceberg hits. But, in his second collaboration with Sophie Fiennes, philosopher Slavoj Zizek shows there’s something quite different going on in Titanic as well in plenty of other popular films (The Sound of Music, Jaws, Full Metal Jacket, Zabriskie Point, Taxi Driver, Triumph of the Will, The Dark Knight and so on) and even in the music of Beethoven and Rammstein. The first Fiennes/Zizek film, The Pervert’s Guide to Cinema, was more concerned with applying psychonanalysis to cinema – a lot of Hitchcock, a lot of Lynch – whereas this is about the all-pervasiveness of ideology in daily life. But it’s not dry or over-cerebral; this is deep political film theory as an entertaining live-wire stand-up routine with Fiennes keeping things interesting by putting her philosopher star within expertly-staged recreations of the films under discussion. The long-term effect is that you start to see other films in the way Zizek might (Elysium is begging for a Zizek reading). In the case of Titanic, you do see a key scene in a way you had not before. Notice that when Rose tells Jack to never leave her, she is actually pushing him away. What are the political implications of that? 7 COSMOPOLIS (dir. David Cronenberg). Like The Master, Cosmopolis was treated poorly by local distributors, dumped on DVD in February with no fanfare, nine months after its Cannes premiere. At least The Master got a brief run on big screens. Maybe we can rationalise it by arguing that Cosmopolis is a relatively private and introverted film, mostly confined to the inside of a limousine as it makes its slow way across Manhattan over the course of a day while business hotshot Eric Packer (Robert Pattinson) calmly watches his financial value disappear. An urgent apocalyptic feeling takes over in the city that he sees through the windows of his noise-proofed car while messengers and underlings bring news from outside. Don DeLillo readers will savour the dry, sometimes cryptic dialogue, even as they finally discover that the speech that had seemed so “natural” on the page seems so artificial when spoken. If the 2003 novel seemed prescient somehow about the bank collapses and the global financial crisis, Cronenberg’s respectfully faithful, even literal Cosmopolis – when viewed a second or third time, as it needs to be – seems like a film for and of its time in ways that you didn’t anticipate back in February 2013 (or earlier, if you lived outside New Zealand). As you watch the young, handsome, charismatic billionaire head steadily towards self-destruction, trashing his wealth and even himself, you might enjoy Cronenberg’s Cosmopolis as a mordant parody of the year’s most lurid stories about Justin Bieber and Miley Cyrus. 8 RUST AND BONE (dir. Jacques Audiard). Jacques Audiard is good on the shame and awkwardness of violence, and its struggle with tenderness, as demonstrated in his prison film A Prophet and before that, his Fingers remake The Beat That My Heart Skipped. Ali (Matthias Schoenaerts) is in the tradition of those films. He is vaguely angry, alienated, inarticulate except with his fists. An Audiard love story – adapted from short stories by Craig Davidson – might seem like a trickier proposition with Marion Cotillard’s Stephanie acting as a civilising influence within parallel stories of pain and recovery. Audiard favours bold characters and strong images, a romantic and adrenalised intensity, which means he pushes his style a little too hard sometimes, but his world is full of life. 9 BEFORE MIDNIGHT (dir. Richard Linklater). Time is the real subject of Richard Linklater’s Before series – and of Slacker, Dazed and Confused and Waking Life as well – which makes it ironic that, in this third movie, when Jesse and Celine finally have all the time in the world, they run out of space. Anyway, remember in Before Sunrise, when Jesse said, “Think of this as time travel”? Keep remembering that. 10 A FIELD IN ENGLAND (dir. Ben Wheatley). A black and white English Civil War period picture with a psychedelic mushroom-trip interlude! After Sightseers, some of us were worried that Ben Wheatley was losing his edge – too much of the British provincial cosiness, too little of the extreme black comedy and hideous violence of his almost legendary Kill List. But in the much wilder, more daring and sometimes even incoherent A Field in England, Wheatley seems to be harnessing the secret energies of a whole range of cult films for his dubious ends. The Japanese horror Onibaba is an influence, alongside the historical realism of Peter Watkins’ Culloden, but you would also need to talk about predecessors like Performance, Witchfinder General and Blood on Satan’s Claw to indicate how berserk things get here. This is narratively shambolic but also brave and atmospheric, like a period horror Withnail and I with added folk music. True, that doesn’t sound so appealing on paper. MUD (dir. Jeff Nichols). There is a sense of timelessness to this Southern fable in which two boys help a killer who is hiding out on an island in the Mississippi. That one of the two boys is Tye Sheridan, last seen in The Tree of Life, only adds to its nostalgic undertow. Regular Jeff Nichols star Michael Shannon is reduced almost to the status of a mascot this time as the attention is all on Matthew McConaughey as the fugitive who maybe loves too much. Only some plot contrivances (a sniper, anyone?) keep it out of the top ten. THE YEAR IN ACTING: Tilda Swinton and Tom Hiddleston as a vampiric couple in Only Lovers Left Alive. Michael Douglas and Matt Damon as a vampiric couple in Behind the Candelabra. Bradley Cooper and Jennifer Lawrence as damaged goods in a story that let them down (Silver Linings Playbook). Greta Gerwig in Frances Ha, Hugh Laurie in Mister Pip and Juliette Binoche in Camille Claudel 1915 – not so much better than the movie than that the movie would be unthinkable without them. PREDICTION: It’s pretty obvious that when he gets to his third film, whenever that may be, Shane Carruth (Primer in 2004, Upstream Color this year) will completely nail it. DISAPPOINTMENTS: Stoker, Elysium, Cloud Atlas, Top of the Lake, To the Wonder. Especially To the Wonder. I was about a third of the way through The Luminaries when I read that the rights had been picked up for television – for 12-hour long episodes, in the manner that HBO pioneered – rather than the movies. Suddenly, the book made a new kind of sense as a goldrush Twin Peaks set in Hokitika, running according to the rhythms of a cable television series watched as a box set (Eleanor Catton cited Deadwood as an influence). You would have flashback episodes and red herrings and long passages of dialogue, all impossible to do justice to in a two or even three hour long movie. If you ever needed a lesson about the perils of adapting an unconventional book at a conventional movie length, look at Cloud Atlas. Television is the way to do it. Since The Sopranos launched in 1999, it’s become routine to say that the quality end of American television is doing serious drama better than the movies ever did. The last series of Breaking Bad only added weight to that – was any movie as discussed as the “Ozymandias” episode (the true ending of the series)? Maybe only Gravity was. The Master should have been. Another question: when did you last see an American movie about White House politics that is as gripping and cynical as House of Cards? Brett Martin’s book Difficult Men, which came out this year, is good on the auteurist ambition of the men – and they are all men – behind The Sopranos, The Wire, Mad Men, Deadwood, Six Feet Under and the rest. It treats the current television golden age much as Peter Biskind treated the 70s directors in Easy Riders, Raging Bulls, except that he has a better critical sense and his story shows no sign of bottoming out yet. Serious television hasn’t had its Heaven’s Gate. The auteurist thinking sees a correlation between the characters and the creators. Is David Chase as autocratic as Tony Soprano? Does Matthew Weiner have father issues like Don Draper? And so on. 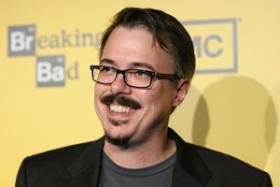 Only Breaking Bad creator Vince Gilligan comes across as a reasonable guy rather than an ogre of the writing room. Was that reflected in the way that Walter White acted – controlling but secretive about it? Martin doesn’t speculate. Maybe it gets reductive to do so. More than any other series that Martin discusses, Breaking Bad felt like a very long movie that happened to be spread across 47 hours of television. It was not just the story arc and the deepening of character but the treatment of time. If you watched consecutive seasons back to back, you weren’t being asked to pretend that a year had elapsed between taking one disc out and putting another disc in. Breaking Bad made more sense watched in blocks. Rather than the slow drip of individual episodes, it was better to binge.